Kanye West has performed at this year’s Glastonbury festival, telling fans he is “the greatest living rock star on the planet”. The rapper’s headline booking had caused some controversy and his performance divided opinion among the crowd on site. Kanye West opened with number one hit Stronger and performed on a largely bare stage with a bank of white lights above. His set was briefly interrupted by a stage invasion by British comedian and prankster Lee Nelson. 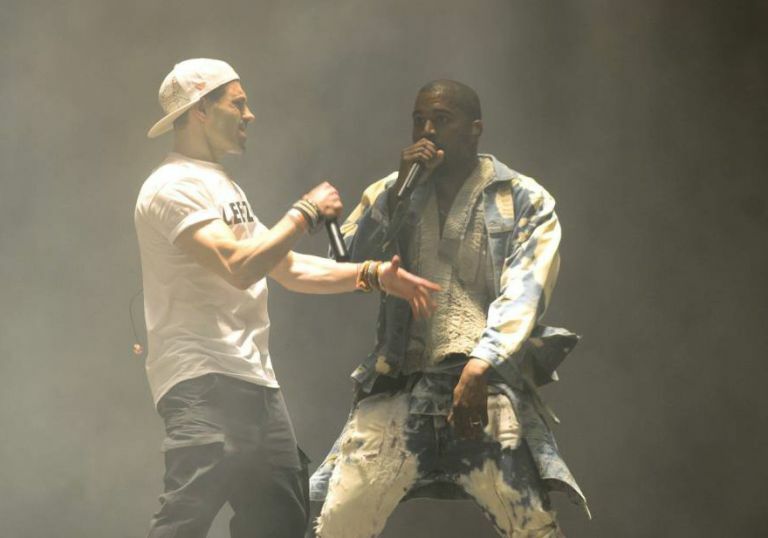 Lee Nelson was swiftly bundled off stage by a security guard and Kanye West resumed his song Black Skinhead. At one point, Kanye West left the stage to travel above the heads of the crowd in the cradle of a cherry picker for the songs Touch the Sky and All of the Lights. His performance came after more than 134,000 people signed a petition objecting to his booking, and Glastonbury organizer Emily Eavis had death threats on Twitter from a disgruntled fan. Kanye West’s appearance was one of the weekend’s biggest talking points. The rapper is one of the biggest names in popular music, with 21 Grammy Awards under his belt and 11 million albums sold in the US alone. However, Kanye West is notoriously erratic and uncompromising, comparing himself to figures including Jesus and Leonardo Da Vinci, and occasionally launching into long mid-set rants. He kept his mid-song chat relatively short at Glastonbury. The online petition had called for Kanye West to be dropped from the Glastonbury bill and be replaced by a rock band. But the rapper has labelled the petition “an insult to music fans all over the world”. At one stage Kanye West was joined on stage by Bon Iver’s Justin Vernon to perform their song Lost In The World. Afterwards, Kanye West revealed that the song had been inspired by his wife, Kim Kardashian, who was watching the show. He followed Pharrell Williams, who played crowd-pleasing tunes including Happy, Blurred Lines and Get Lucky on the Pyramid Stage. Pharrell Williams was joined by a group of children on stage to dance to Get Lucky. Other acts performing on Saturday included Burt Bacharach, George Ezra and Paloma Faith. Celebrities spotted at the festival included Adele, Coldplay singer Chris Martin, Lewis Hamilton, Stella McCartney and James Corden. The weather on the Somerset site brightened up on Saturday following Friday’s rain, although more showers are forecast for Sunday. The Who will close the festival on Sunday, Lionel Richie will perform in the festival’s now-established Sunday afternoon legends slot and Tibetan spiritual leader The Dalai Lama will visit the festival’s Green Fields.